The Edward Green pop-up sale is always a popular one – in fact a reader asked me last week when it was going to be on. I can’t reveal the dates until they are public unfortunately, but they now are. The sale will be held at the Truman Brewery, 8 Dray Walk (just off Brick Lane) from this Thursday. Times are 11am-7pm, Thursday to Saturday, and 11am-4pm on Sunday. Enjoy! You can follow the discussion on Edward Green pop-up sale, from Thursday by entering your email address in the box below. You will then receive an email every time a new comment is added. These will also contain a link to a page where you can stop the alerts, and remove all of your related data from the site. The design of these loafers seems to be different from that we have seen so far from Edward Green. A take on the typically French design (JM Weston)? The Duke of Windsor, formerly King Edward VIII, was a style icon. He made the penny loafer fashionable; and we made his penny loafers. It seemed natural that with increasing demand for the slip-on we turned to the Duke of Windsor for inspiration, and named the shoe in his honour. 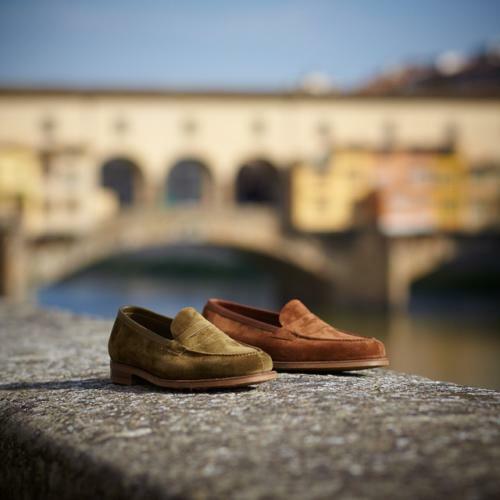 Our ‘Duke’ is made on a new walled loafer last – the 137 – designed for a supremely comfortable fit. It comes in a variety of suede, calfskins and cordovans including the Duke’s favourite two tone combination. Thank you for providing this information, Simon. Somehow I prefer this kind of loafers for Jeans and chinos. Thank you for the heads up, Simon. Any insight if the sale will be joint with any other manufacturers? I recall last year was with Begg and Drake’s previously. I wanted to know if, during your “journey”, you have been very disappointed on how some of your bespoke jackets/ trousers/etc came up in the end. I realize for you it is a slightly smaller problem because you have much more projects in progress than me. I commisioned a jacket to my tailor ( my first jacket with him) and in the end it came up “ok”, not bad by any means, but not great as I expected and as I said I’m a bit disappointed. Interesting Enzo. I’ve certainly had a few things I would change, but rarely been that disappointed. I can do a post on general disappointments or issues I’ve had if that’s helpful though? I don’t suppose you know what kind of % discounts will be on offer? Luckily I am in London for the day on Friday (the first time I have ever caught a sale “window”) and I was wondering if it worth the trip across, as opposed to visiting their shop on Jermyn street. Might be helpful, or better interesting. Someday ago I sent you an email with the pictures . Maybe you missed it and I can re-send the email. This is one of the reasons why tailors never used to advertise themselves. Most of their business was word-of-mouth. It’s best to see the cut on other people first, if possible. Any Herbert can make a jkt look good on a mannequin. That said, good communication is key. No different to trying a new barber for the first time. The price you paid will also be reflected in the final suit. The best guys are more expensive than the mediocrities. There’s absolutely no way around that. Yes, your many posts have certainly reflected that, Simon. It’s very difficult to make a bespoke suit. Truly it is. There’s no blueprint. Each client has a new shape and new problems technically. You start from scratch each time. An average bespoke suit is usually much better than RTW. A great bespoke suit is beyond any coherent description. Price ceases to be of much relevance. Separately, Simon have you any knowledge of collarclub.com (a “shirt subscription service”)? To me it sounds like the antithesis of everything you would suggest (buying high quality shirts and self-laundering), but is perhaps an interesting idea nonetheless. Good to know. Keep us updated. 10 min wait when I was there around noon. GY welted shoes in the £325-420 range. Unwelted loafers/slippers for £95-125. Not a lot of UK8.5 left maybe 15-20 pairs. Other sizes more like 30. Saw one Dover in size 7, plenty of browns, not many blacks. Good selection of spectators (with white suede which no one else seems to produce RTW) if anyone is in the market. Picked up a pair of unwelted tassel loafers for £95. Super comfy. What kind of discounts were on offer? Went yesterday morning and one of the first to be in. Tube strike must have really impacted the numbers as I was expecting a long queue. Bought a pair of boots and plain black cap toes. Edward Green shoe trees were £35 a pair so had two to go with my new purchases. Very pleased! They sold belts at £70 too. How much did you pay for them, if you don’t mind me asking? These are seconds as opposed to a heavily discounted shoe they would otherwise sell in Jermyn Street. They do have a couple of odd sized firsts at £430 there too. I went in at around noon yesterday: there was no queue, and there were perhaps ten other customers in the shop. There were 40 odd pairs in my size (10-10.5), all in “sensible” colours, with some lovely suede options as well. I managed to get a pair of chestnut coloured midfords on the 82 last for £195! I also nearly bought a pair of oundles for £325, but the colour was too close to my new midfords. I strongly recommend going along if you are in the area. Thanks for flagging up the sale Simon. Now, back to mirror polishing my new toe caps…..
On the topic of sales, does anyone have any idea when the Drakes factory sale is going to be this year? Was mid-December last year so assume may be the same for 2015. That was a great sale – not only for ties but cashmere knits, scarves, shirts etc.